Well made, really soft duvet. Looking to update your bedding? Our new prints are on trend with the latest styles and fashion for your bedroom decor. These Duvet Cover Sets are in high demand. They bring a fresh new look and allow you to create a bedroom as unique as you. You will love the extra soft feel of our high quality 100 GSM microfiber and get the most comfortable night's sleep. Convenient and easy to care for just machine wash and pull out of the dryer wrinkle free. Stain and fade resistant these duvet covers are durable and made to stand the test of time. Four corner ties prevent uncomfortable shifting and a hidden zipper closure protects and nicely covers your insert. High-quality bedding is what sets Southshore Fine Linens apart from the pack. We will always strive to deliver quality, style, and value to you, our customer. You can purchase worry-free with our promise of a 90-day limited manufacturer warranty. Twin/Twin XL: Includes only one pillowcase. Dimensions 10.0 In. X 10.0 In. X 3.0 In. I just love the way this cover feels! Its like a really thick expensive sheet. And it is so so soft....the color is exactly as I thought it would be and the design is very pretty. I love dark colors and dark colors are hard to find. I washed it and put fabric softener in it and it was even softer. Just wish it came with 2 pillow shams. I ordered the twin XL. I would definitely recommend this to my friends. For the price it is well worth it. And it is very well made too. It also matched the new blue sheets I bought. When I received it, it looked exactly as it was pictured. I have to give it 5 stars because I cant say anything bad about it! The reversed side is just as pretty too. You wont be disappointed with this one. There is one thing, it says that it is a 3 piece, but it only came with 2 pieces. Maybe because its a twin, I dont know. But the pkg it came in says 3 piece. I bought it in light blue color, material is perfect, I love the zipper closure on it. I would recommended this product. You won’t be disappointed. I am going buy another duvet set but different color. 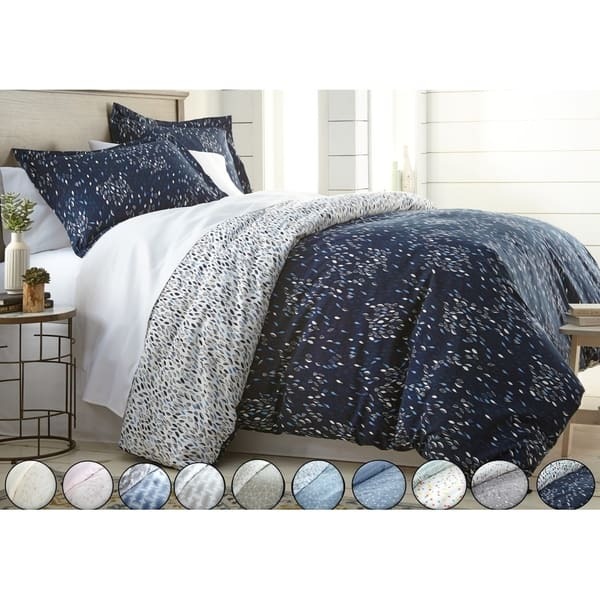 The duvet cover is super soft and pattern is true to what shows on the website. I would've kept this duvet cover, except the pattern turned out to be a little too busy for my room decor. Normally I am not a microfiber fan, but this set is very soft and I love that there is a zipper. I use my duvet covers for sheets with a light blanket inside. This is perfect. So happy. Love this cover set. Well made.l Looks good. I have a very thick comforter in it, I would like it to be a little longer her and wider to completely cover the edges of the mattress (that's why only a 4 star). Would maybe order a king for a queen (my mattress is thick too). Nothing wrong with quality and looks great. I love the color and design - it was true to the picture. It is softer than I expected and fits well on my king sized duvet and bed. I could see it being a little small for a california king bed. exactly as pictured and great quality. I love the zipper and internal corner ties. I bought three sets for three different kiddos' rooms. This is an easy way to update or refresh a look. With Spring coming, I wanted to brighten up their spaces, without spending a ton of money. Good quality, like the zipper. This item arrived relatively quickly and in excellent condition. We love the color, the pictures are accurate. The material seems nice enough. We haven’t used it yet, but it seems like we’ll really enjoy it. When I opened up package it was supposed to be reversible very disappointed it was the same color on both sides ! But I did keep it. Looks great on the bed, perfect match, it is a warm grey with a undertone of green. Soft to the touch. Son wants duvet cover with ties inside and subtle coloring.